Video takes a look at Issac Newton’s first telescope « Adafruit Industries – Makers, hackers, artists, designers and engineers! 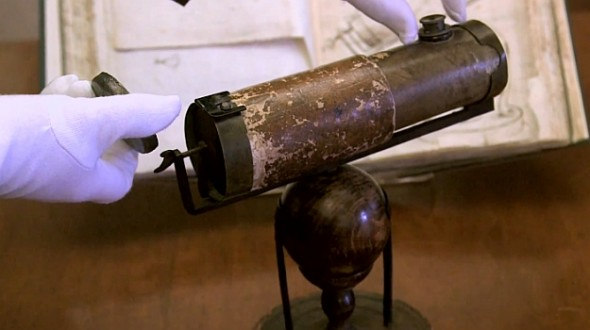 There’s an interesting post via Geek.com about Sir Isaac Newton’s first telescope. For more than 300 years, the Royal Society in London has watched over the device you see above. It’s Sir Isaac Newton’s first telescope, which he built around 1668. That was about 60 years after German spectacle maker Hans Lipperhey patented his original design. Lipperhey’s invention was a refracting telescope. Newton’s, on the other hand, was a reflector and it used a convex mirror made of a very special alloy to refocus light. That metal is speculum, so called because it’s the Latin word for mirror. It was a good choice for making mirrors in the 17th century, though it’s a bit heavy by today’s standards. Speculum is a mixture of (roughly) two parts copper and one part tin — both very dense metals. There are a couple other problems with speculum, too. It tends to tarnish rather easily, and it only reflects about two thirds of the light that hits it. Still, it provided a serviceable component that allowed Newton to begin exploring his theories. It’s the speculum mirror that interests University of Nottingham chemistry professor Martyn Poliakoff most. He notes that there’s a particular “sweet spot” that has to be found when making the alloy. Too much copper in the mix imparts a red tinge; too much tin and it goes blue. A pinch of arsenic is added to ensure that the finished surface accurately reproduces the colors it’s reflecting. That’s actually what Newton was hoping to investigate — he wasn’t specifically preparing to gaze at the heavens. He believed that refracting telescopes like Lipperhey’s distorted the colors of objects because they didn’t focus the light they captured precisely enough. As Poliakoff enthusiastically notes, it’s very cool that at the heart of Newton’s telescope — an instrument that proved important to the future of physics — was a little bit of chemistry.